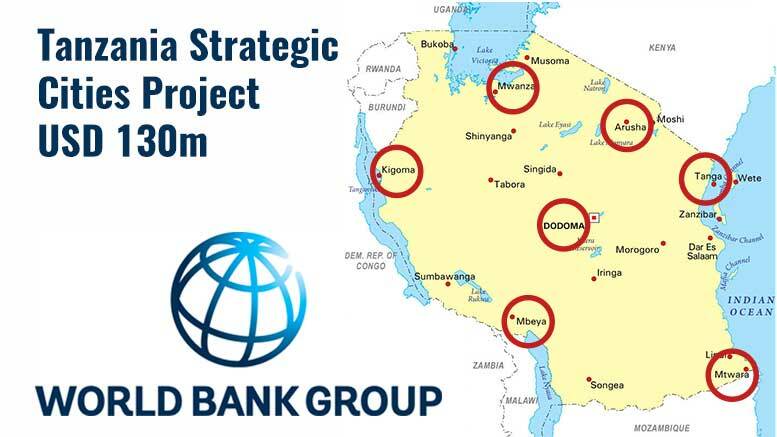 The World Bank Board of Executive Directors approved up to USD130 million in additional financing for the Tanzania Strategic Cities Project (TSCP). The project covers eight rapidly urbanizing cities in Tanzania: Tanga, Arusha, Mwanza, Kigoma, Dodoma, Illemela, Mbeya and Mtwara, to enable them keep up with the pace of rapid urbanization. The cities will benefit from funding to scale up infrastructure investments and promote growth. “Improving services in Tanzania’s medium-sized cities is critical to support the Government’s industrialization goals. These cities play a key role to strengthen broader regional development, to connect people with markets, and provide the foundation to promote the growth of industries across the country.” says Bella Bird, the World Bank Country Director for Tanzania, Malawi, Somalia and Burundi. The TSCP has been under implementation since September 2010 focusing on three components; namely: (i) Core urban infrastructure and services; (ii) institutional strengthening; and (iii) Implementation support. TSCP was initially financed by USD175.5 million of which USD163 million was from the World Bank and USD12.5 million was from Denmark. The project first received additional financing in 2014 amounting to USD50 million from the World Bank and USD6 million from the Danish International Development Agency (DANIDA). This is therefore the second time it is getting additional resources. Since its implementation, the TSCP has built 141km of urban roads, 15km of major drains, 6 bus stations, 317 solid waste collection points and 5 sanitary landfills, benefitting more than 1.2 million residents. The project has also built Tanzania’s very first sanitary landfills, while developing the capacity of and establishing a community of practice for landfill operators. In addition to the TSCP, the World Bank is providing support to Tanzania’s urban development through several other operations including (i) the Dar es Salaam Metropolitan Development Project; (ii) the Urban Local Government Strengthening Program which is a Program-for-Results; and (iii) the Zanzibar Urban Services Project, as well as other technical assistance and analytical programs.